As a parent to two young children I spend a ridiculous amount of time cleaning up after them. I also spend a lot of time getting things for them. Snacks, toys, craft supplies; not a day goes by that I don't hear "Mama! Can you get me my (fill in the sometimes irrational request)?" Don't get me wrong, I love to do things for and with them, but I also want them to be independent and give them the confidence to know they have the capability to do these things on their own. 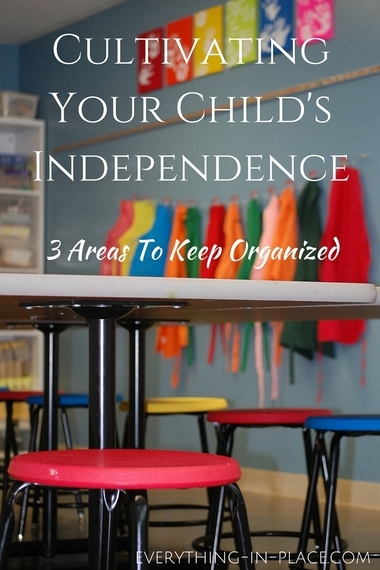 It's not just their toys that need to be organized, other areas of your home can contribute to their autonomy as well. If you have a spot where you can place their plates, bowls, cutlery, etc. that is within their reach, use it. My kids really like to choose their own forks and spoons, so I always have them in an open bin that they can access within the cupboard or take out easily if they choose to. We also have very deep cupboards in the kitchen (this can be challenge, I know), so it's really important to have the everyday stuff right in the front. Save the back for the items that you use less frequently. Having their things accessible means that they can easily help set the table, or get the appropriate piece of cutlery when they need a snack. Another helpful tool in the kitchen is a water cooler. We had one for years and it meant that every time my kids yelled that they were thirsty both their cups and water were easily within reach and they could help themselves. I won't lie, there were more spills on the floor than I could possibly count, but hey, it's only water! It is also incredibly helpful to have a place where their snacks are handy. If you have a place in your pantry and/or your fridge that has healthy, parent-approved snacks already portioned out you can save yourself a great deal of stress. We all try to find that balance between getting stuff done with the kids around and not letting them watch too much TV. Once my kids are home from school they each get to pick one 20-minute show and then the screen goes off (this isn't a hard and fast rule; I find the later I get into this pregnancy and more exhausted I become, the more this rule gets stretched). Once the TV is off I need to entertain them, and since this is generally the time that I am putting dinner together or finishing up my work, they need to play on their own. For that reason I love having a craft station. Their craft station is a rolling Ikea cart in between two tables. Everything is in clear bins that they can open and close on their own. I also keep a supply of blank paper, colouring books, Play-Doh and stickers. One of the tricks I use is to not have everything accessible to them all the time. I have more supplies stashed away. I don't keep everything out, I rotate and restock as needed. Too much of a good thing isn't actually a good thing. The result is a space that works for all of us, with constructive play time and work happening together. I cannot overstate how important it is to keep their toys organized and to a minimum. The less there is, the better they play with what they have and the more they can use their imaginations. I've seen it with my children and with countless clients whose playrooms I have reorganized. Kids play better with less. Period. If you don't want to just get rid of all their toys (which is completely understandable) try having a rotating stock and only keep a few things out at a time. In terms of organizing their play area, the same guidelines apply. Have things at their level, in bins or baskets that they can open on their own. You can use pictograms if necessary, and please, please, please take a few minutes to explain the system to them. Sit down and show them how you have organized their toys. 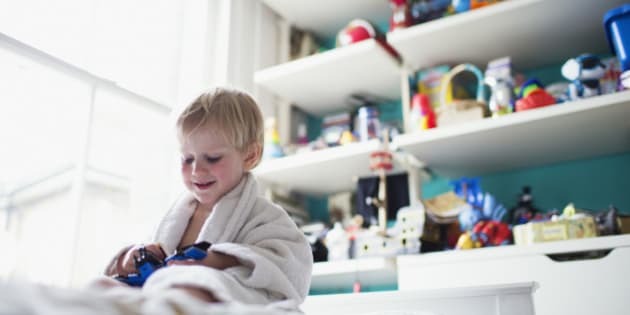 Explain to them where to find everything and that they need to clean up and put away one set of toys before they are allowed to move on to the next. I'm not saying this is a foolproof system. They are kids, and won't always clean up when they're done. But you certainly can't expect them to know what to do if you don't explain. Encourage them and then reinforce the positive things they do. I want my kids to become helpful and contributing members of society and I don't think that by doing everything for them I am fostering that kind of independence. I think it is important to take away as many roadblocks as possible that sit in the path of the little tasks your are asking of them (you are not going to get your kid to grab their favourite puzzle without your help if you've placed it on a completely inaccessible shelf). You should have things organized in a predictable way that makes sense to them. Grouping like items together, having easy to open bins and easily identifiable contents, are just a few of the ways to accomplish this. I'm not guaranteeing instant success and that your child will suddenly do everything on their own, but these are great first steps towards their autonomy.